My goal in this post is to debunk the myth that filling Outdoor Planters with fresh greens for the holidays is difficult and expensive. You probably have most of what you need right in your own backyard. 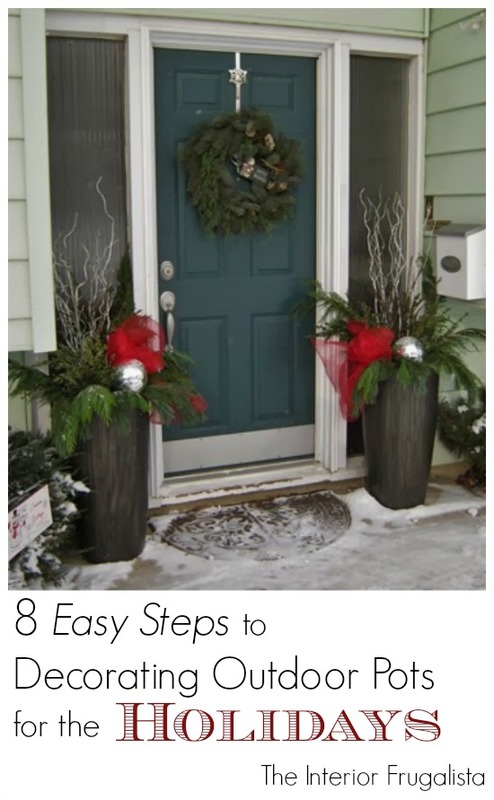 By following the steps in this post, you can make your own festive outdoor planters to welcome guests during the holidays. Hopefully, you already have large pots or urns on hand that you use during the summer months. If not you can purchase relatively inexpensive plastic ones at your local home improvement store or garden center. The pedestal styles look beautiful for this purpose and are often on clearance during the Fall. As you can see from the picture above, my pots are quite large so a trick I use year round is to fill them two-thirds with pea gravel and slip an inexpensive plastic insert on top of the gravel so it rests just under the top of the planters. In the Spring, it's convenient to take the plastic inserts over to my potting bench and fill them with flowers. In the Fall, I remove the wilted flowers and bring the dirt filled inserts indoors, stored in plastic bags, to prevent the soil from freezing. During the holidays, I can fill the inserts with fresh greens from the comfort of indoors while listening to Christmas music and enjoying a hot cup of apple cider. You want to make sure the drainage holes are covered so you can freeze in the greens. I use plastic saucers that fit snuggly over the gravel/dirt inside the urn. A handful of tall natural or painted willow branches. If you're lucky enough to have any of these growing in your yard or a natural green space nearby then grab your gardening shears and head outdoors. Position your lighted branch stakes in the center of the insert. If your arrangement is against a wall then place them at the back of the insert. Cut your tall natural or painted willow branches so they stand slightly taller than the lighted branches. Intersperse them with the lighted branches so the willow branches are illuminated. Tip: Press your branches deep and firmly into the soil. Working in a triangle, insert the more firm Spruce or Pine branches in the center around the tall branches. If the arrangement is against a wall then avoid placing branches at the very back of the pot. Tip: To avoid rot, clip greens back so only the branch is inserted into the soil. Put the Juniper or Fir branches at a slight angle so they are pointing sideways. Put the cedar branches on the most outward part of the insert so they hang downwards around the pot. Make a simple bow with tails using Mesh Ribbon. Secure the center of the bow with florist wire, leaving enough on the ends to attach the bow to the lighted branches. Attach a large shatterproof Christmas ornament, willow ball, or large pine cone onto a stick with florist wire or a hot glue and insert it into your pot. Repeat this process with any other embellishments. Mist the greens with water and then thoroughly water the pots to freeze in the fresh greens. If the temperature goes above freezing, spray & water the greens daily. I went with a minimal amount of fresh greens to keep costs down but you could add twice as many bundles and/or varieties for a fuller look. Berry branches or picks are a nice added touch for a pop of red. If you found this How To Fill Outdoor Planters For The Holidays tutorial helpful, please save it on Pinterest and/or share it with a friend. There is something about the curb appeal of a house with tall lighted Christmas Urns flanking a door that sets it apart from the others down the street. It's such a welcoming touch to greeting guests during the holidays.